Custom Copper Bath Tubs: Double Wall Oval, Rectangle, Round & Square. Everything We Build Is Built To The Customer's Specifications. 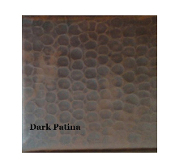 You Choose The Size (Odd Sizes Welcomed) Mix & Match 16 Patina Finishes And Choose From Over 200 Decorative Designs. 12-14-16 Gauge Copper. What Can We Build For You? All Copper Bath Tubs Are Hand Made When You Place Your Order! Why Settle For What's In Stock, When You Can Custom Design Your 12 Gauge Copper Bath Tub. Customer Service 800-989-5166. Before Buying, Be Sure To Check Our Coupon Page For Our Latest Sale Discounts!